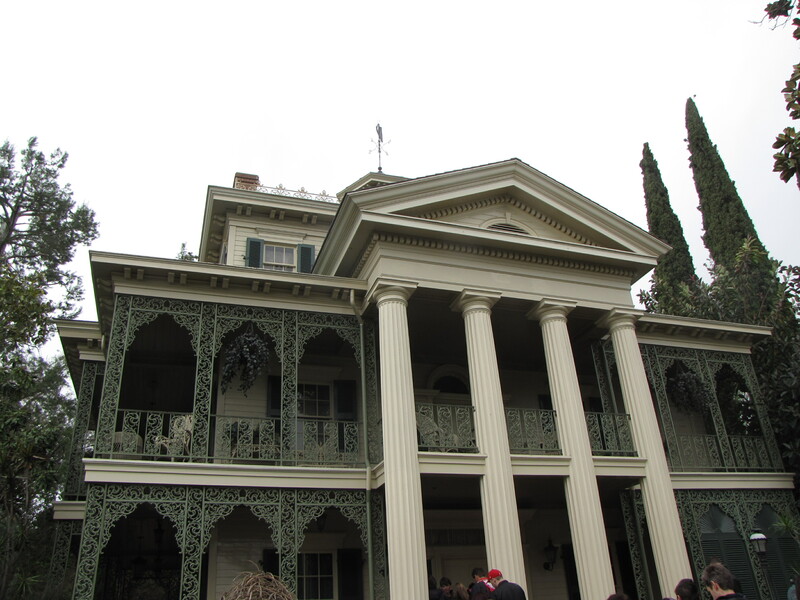 The Haunted Mansion is a partially-fun/partially-dark take on the traditional haunted house. It has some pretty impressive effects–some of which are anything but state-of-the-art, but still very effective, but at the core, that’s still what it is. Personally, I enjoy the attraction (in its regular form, not really a Haunted Mansion Holiday fan). It has catchy music, a great narrative, and the aforementioned impressive effects. It’s also a great walkthrough of our lives. You see, it’s easy as Christians to say things like, “Take my life,” and “I surrender all,” but it’s a lot harder to do than to say. We try to keep one (or more) parts of our lives back, out of the reach of God’s light. Maybe its because we like them the way they are, or because we’re too ashamed of them, or we think the changes we’ll have to make will hurt too much. That’s exactly where love, peace, joy, hope, freedom, and more come from, though. And it’s going to happen anyway. What parts do we hide away? Take a little trip with me through the Mansion and we’ll see. The Stretching Gallery – This is where we start, where the outside world comes inside. We’re surrounded by portraits that look fun and interesting. But when they start to stretch we see what was previously hidden. Things are not as pleasant and prosaic as they’d seemed. This room represents our circumstances, outside influences, and environment. The externals that we hide from people. Maybe you’ve lost your job, you have relatives that you’re ashamed of (or worse), you’re not at the socioeconomic level you’d like, or your job isn’t as prestigious as you’d like. Or maybe it’s something darker, you’ve been the victim of something horrible done by someone who can best be described as evil. You don’t want anyone to know, and you certainly don’t want to bring it into the open before God. The Hall of Portraits – These portraits all look innocent, even impressive, until the lightning flashes. When light shines on them their true nature is revealed. All our “deep, dark secrets” live here–the things we put a nice face on to keep anyone from knowing they exist, but deep inside we know what they really look like. Not circumstances or outside influences, but our character , quirks, and faults. On our worst days, we think these are what define us, and because they make up something we accept as part of our identity, we cling to them. We know we shouldn’t, in many ways we don’t want to, but then we ask ourselves, “Who would I be without _______?” Or we say, “I’m really just a ___________, and I can’t change that.” So we hold back, hide from the light, and don’t let God reveal our true identity in Him. The Corridor of Doors – Death isn’t as fun for these haunts as some of the later ones. They want out of their coffins, to be freed from the doors. This is the hallway of our fears, and actually contains several of them. Often, clinging to our fears gives us a sense of safety. As long as we remain afraid of these things, we can stay right where we are, no risks, no challenge, no failure. Some things should rightly be feared. But all these can and should be brought before God and examined. Some of these fears are unfounded and will melt away in His light, and you can move into a new adventure that your fears are holding you back from. The Creepy Clock – Time. Plain and simple. We grasp desperately to our schedules, our daytimers, our calendars. Every minute is scheduled for some; for everyone the status”busy” is worn almost as a badge of honor. But if we have no margin in our schedules, if we aren’t willing to allow ourselves to be interrupted by God, then how do we obey Him when He guides us? I’ve heard it said that I can know what you value by looking at your checkbook and your calendar. What does yours show? The Grand Ballroom – This is the party room! Fun is good. God is not a party-pooper. But sometimes we want to have our fun apart from Him. We indulge. We revel. We say, “It’s all in fun.” But it can also distract us. It can take our eyes and our focus off Him. And sometimes we have fun in ways that are counterproductive, harmful, or even destructive. We may not recognize it–or maybe we do but don’t want to admit it. If we won’t admit it to ourselves, we certainly won’t to God. This is also the room where our creativity “lives.” Music, dance, painting, even cooking and decorating, it’s all here. We keep it here because we enjoy it. What if we allow God in here? Will He take it away and make us do things that are boring, dull, and lifeless? Maybe He’ll let us keep doing it, but make us do it in boring ways that stifle our creativity. yet God is our Creator, and He made us in His image. Doesn’t that mean we are created to create? As with the others, though, we want to keep it to and for ourselves. The Attic – Ah, the Bride and her husband–or is it husband(s), since there are at least five portraits in here? Apparently all her grooms had some trouble keeping their heads about them, though. We keep our relationships here, and not just marriage, but any of them. Maybe we know it’s bad for us but we want to stay in it anyway. Maybe we think it’s good but wonder if God disagrees. Maybe we’re afraid He’ll take away that one relationship we really want to preserve. When we’re that protective of a relationship, though (even an otherwise healthy one), it becomes an idol. The Graveyard – We finally come to the one you may have expected from the beginning: death itself. Sometimes we prefer to treat God as a genie, existing only to grant our requests and make sure things go well for us. We try not to think ot much about heaven and hell, because that might require us to make some different choices. Long-term perspective often requires different choices. They also lead us to think of consequences. Suddenly our day-to-day activities and attitudes take on a greater significance. You probably noticed that three of these have no connection next to them. That’s because I can’t think of them right now. I’m sure they are there, but they’re not coming to me. I’ll bet you have some ideas, though! So in the comments below, please tell me what connection you’d make for the Endless Hallway, the Seance Circle, or the Hitchhiking Ghosts. What do they represent that we try to hide from God, or don’t fully surrender to Him?